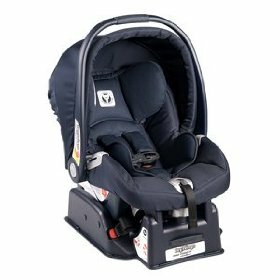 When safety is one of your primary concerns then you need to get the Peg Perego Primo Car Seat, because it has exceeded the most stringent Side Impact Protection tests. The Peg Perego Carseat has a softly padded 5-point safety harness and moveable Side Impact Protection wings to help protect your child's head and body from all angles. The coordinating LATCH system base allows you to easily secure the this car seat to the vehicle. Or, without the base you can easily fasten the baby car seat with your vehicle's seat belt. The automatic attchment system makes it a perfect complement to ALL Peg Perego strollers. Patterns and Colors: Cedro, Papaia, Titanio, Corallo, Oltremare, Black Tie, Moka and the Limited Edition Paloma. Customers who buy the Peg Perego Primo Car Seat also buy the Peg Perego P3 Stroller .